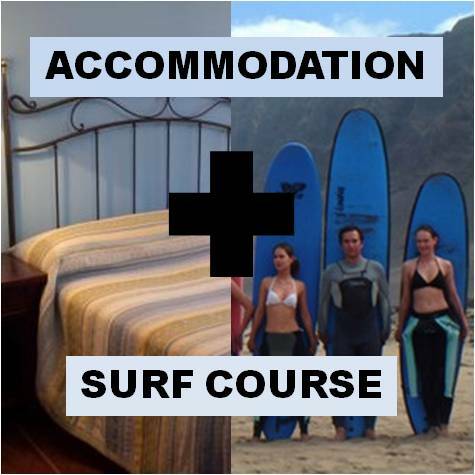 SURFING COURSE 5 days + ACCOMMODATION 6 nights. Get your Surfing pack today with accommodation included and SAVE Big!!! BOOK your SURF PACK NOW, and save big!!! Learn to surf in Famara beach (Lanzarote) with the best instructors. No need of previous surfing knowledge. The objective of the surfing course is to have fun in the sea with all the safety. You will learn the surfing basics, and to start catching your first waves, and if possible to start standing up on your board riding the waves to the shore. We will also teach you the possible dangers or hazards at the beach, so afterwards you can practice the sport safely on your own. The surfing classes are given so you go at your own pace with no stress and no hurry other than the pressure you want to put on yourself to get better, we will just provide a good attitude, motivation, and all the technical knowledge so you can achieve your goals. We encourage you to come and try it. You will never forget your first wave! !